The brooch at the left was insprired by the Duchess of Windsor's 1940 Cartier brooch but it is costume jewelry that is part of the Kenneth Jay Lane jewelry archives. The vintage "fake" was on view at the Norton Museum in Palm Beach in a show called: "Kenneth Jay Lane: Fabulous Fakes." 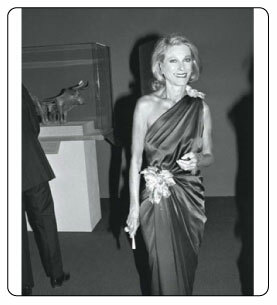 The exhibition included a copy of the Van Cleef and Arpels necklace Aristotle Onassis gave his new American wife as a wedding present in 1968 and loads more. 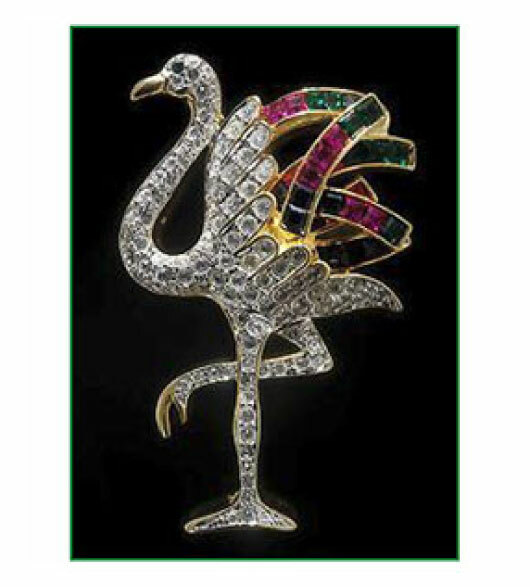 If you didn't make it to Palm Beach to view the show, maybe you can satisfy your Kenneth Jay Lane jewlery craving here. 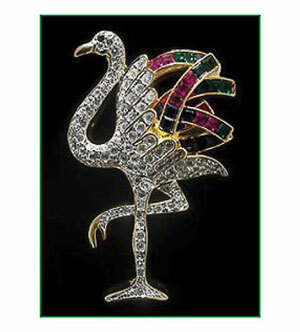 Of course, jewelry style and taste extends to the master jeweler's home which is a little bijoux in its own right. According to Wikipedia, "Since 1977, Kenneth Jay Lane's home in Manhattan has been a duplex in the Stanford White mansion completed in 1892 and one of the few surviving mansions on Park Avenue. From 1923�1977 it served as the home of the Advertising Club. At that time it was converted into a cooperative apartment house. His living room is the former club library and features an original marble mantelpiece, a wide variety of original artwork and several lamps designed by Robert Denning of Denning & Fourcade." 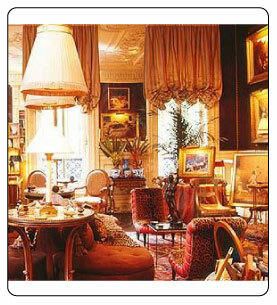 Here's a photo of Kenneth Jay Lane's living room which shows his flair for decorative home decor. Isn't home decor just jewelry for the home? You can read a biography of Kenneth Jay Lane on Wikipedia that chronicles the designer's long career. His client list is totally impressive. One of his great pals was the socialite, Nan Kempner. After Nan's death, The Metropolitan Museum devoted a show to Nan. She was described as an All-American fashion icon and the Gift Shop had reproductions of jewelry by KJL that Nan Kempner wore. In the new book by Lisa Bernbach, True Prep, Kenneth Jay Lane jewlery is said to be the costume jewelry of choice of the choice. Of course that's not news! Fashion icons like Audrey Hepburn, Jackie Kennedy, Elizabeth Taylor, Diana Vreeland, Nan Kempner, Madonna, Nicole Kidman and Sarah Jessica Parker all wear, or wore, Kenneth Jay Lane jewelry. Not only do celebs who wear Kenneth Lane jewelry look fabulous but they contribute to society in ways other than fashion. That's what we love about them. When Oprah's editor's were looking for the perfect get away jewelry, we sent them our shell earrings which later appeared on Oprah's "Must Have" list." Here's what the Kenneth Jay Lane jewelry company says about the women who wear their line: " As impressive as it is that Royalty, Celebrities and Socialites choose Kenneth Jay Lane; it is not the designer's primary focus. The designer's creations are inspired with the everyday woman in mind." The gals who wear Lane's costume jewelry are a pretty glam group. Join them! Fill your jewelry box with our Kenneth Jay Lane pearls, KJL necklaces, earrings, bracelets, shell earrings, red coral necklaces and you'll never be wondering what accessories to wear. Letitia Baldridge, Jackie Kennedy's social secretary wrote: "Good taste is synonymous with success in all fields of life. It's not a question of money but of a trained eye." You don't have to shop at Van Cleef's to look fabulous, especially when you know the secret of Kenneth Jay Lane jewelry. See our Gifts for Women section for more great women's gift ideas.